Fire at San Luis Rey!? in good condition for his age. Kudos to her though, not too many horses get up there in age. RIP Chance. Tim Ritvo of The Stronach Group, parent company of San Luis Rey Downs, said Sunday the training center could reopen Feb. 1 for limited training for 200 horses with the goal of having temporary stabling completed April 1 to replace barns destroyed in Dec. 7 wildfire. Martine Bellocq still has a long way to go. The trainer who went into a burning barn Dec. 7 at San Luis Rey Training Center in an attempt to rescue a prized young colt has third degree burns on 60% of her body, and although she has made some progress, the challenges ahead are substantial, according to her husband, Pierre Bellocq Jr.
"She's stable, but she has had some complications that usually show up after these kinds of burns," Pierre said of his wife, who was air-lifted from San Luis Rey to UC San Diego Medical Center, Hillcrest in the moments after the fire. She's still at Hillcrest as of Jan. 10. "That has slowed her recovery considerably right now. We just have to be patient with it." Pierre said Wednesday that while her medically induced coma ended relatively quickly after the fire, Martine is still under significant sedation, which doesn't allow her to talk. Pierre hopes as her medical procedures continue, the outlook for his wife will improve. "As soon as they finish the skin grafts and all that, she may pick up some momentum," Pierre said. "The biggest struggle is, she's still not able to talk to us, and it's a little bit scary, because physically she looks pretty much like she did on day one after the fire. ... She's not conscious enough to speak and she's still on a respirator most of the time and there are tubes everywhere, but she can hear us. We're going to keep talking to her and encouraging her. "Every day it keeps reminding you of what happened, and that's the hard part for me, anyway." Pierre's recollections from that Dec. 7 afternoon are as just as vivid as if they occurred yesterday, and have the echoes of other accounts of the terror at San Luis Rey. Martine and Pierre, who work together training horses under Martine's name, got separated for a while as small fires popped up around the training facility. Pierre was out helping the facility's staff and other trainers to try to put out spot fires on the hills surrounding San Luis Rey, while Martine stayed at the barn with their string of six horses. Martine was hosing down the barn, as well as the horses in the stalls, to try to keep everything as moist as possible. "At one point it looked as though we were going to be OK," Pierre recalled. "Fire trucks arrived and they put out most of the surrounding fires. But when the palm trees ignited, I knew that would be a disaster. Within minutes, it was all over." Pierre got back to the barn and quickly grabbed a horse to try to get it onto a trailer, so it could get out of the facility. What he returned to was beyond horrifying. Martine had high hopes for Wild Bill Hickory, a 2-year-old Many Rivers colt she bred with Margaret Sherr. When the fire got into the barns, Wild Bill Hickory was trapped inside, so Martine went into the blaze to save the unraced chestnut. "He wasn't a fashionably bred horse, but he was a gorgeous specimen—perfect confirmation, such a nice individual," Pierre said. But Martine's heroic efforts weren't enough to save the colt. Wild Bill Hickory died from the burns he sustained, and Martine was also severely burned. By the time Pierre got back to the barn he found Martine slumped on the ground and burned, but still crying out for her beloved colt. If not for the actions taken by fellow trainer Manuel Calvario, it may have been worse for Martine. Calvario, who was the Bellocqs neighbor in the barn at San Luis Rey, saw Martine engulfed in the fire and snuffed out the flames with a blanket. "He probably saved her life," Pierre said. With Martine still hospitalized, Pierre has to care for the four horses they still have. Much of his time is spent beside his wife, but during morning training hours, he tends to the quartet at Del Mar. He has mixed feelings as to whether the slight escape helps him cope with what happened. "Does it help? Yes and no," Pierre said. "To have some kind of routine in the morning—something else to do other than go back in my mind to the fire and the situation—it is good to have a little bit of a change of pace. It occupies your mind too for a few hours, and then it's back to dealing with Martine and the fire." 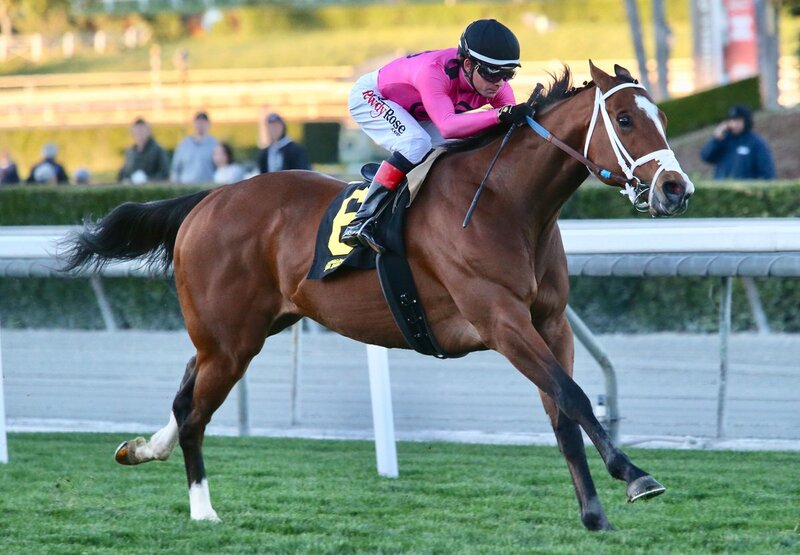 One of those four trained by the Bellocqs will make her first start since the San Luis Rey fire Jan. 11 at Santa Anita Park. Eye of the River will be the first starter in Martine's name since that terrible day in December. The 4-year-old Many Rivers filly, also bred by Martine and Sherr, has had an uninspiring career at the races (she's yet to hit the board in six starts and will be offered for a $20,000 claiming tag in the one-mile dirt race), but will have a unique opportunity to transcend her résumé Thursday. That goes beyond horrific. Keeping her and her husband in my prayers. The Martine Bellocq-trained mare Eye of the River outran her high odds to finish a good second in the 2nd at Santa Anita. I hope this nice run from one of the Bellocq stable's SLR survivors provides a lift for those folks, who really deserve some luck. BaroqueAgain1 wrote: The Martine Bellocq-trained mare Eye of the River outran her high odds to finish a good second in the 2nd at Santa Anita. I hope this nice run from one of the Bellocq stable's SLR survivors provides a lift for those folks, who really deserve some luck. That's nice to hear. Wishing the best for Martine. The temperature of such a fire, and the speed with which it produces such damage, are just unimaginable. I didn't see anything in the article that says where to donate to help Mr. Herrick and his filly. If anyone knows where I can mail a check to him, please let me know via PM. Thanks. A month ago, he was lost in the fire's smoke. We know where Conquest Tsunami is today -- in the @santaanitapark winner's circle after race 9. "Hope rises like a phoenix from the ashes of broken dreams." Conquest Typhoon had a 3F work today in 37.80 (10/13) at Del Mar. Sparrow Castle wrote: Conquest Typhoon had a 3F work today in 37.80 (10/13) at Del Mar. It's hard to forget that face with all its burns at Trifecta, but it must have healed well or they couldn't have put a bridle on him. Thank God for modern medicine and hyperbaric chambers. Churchill Downs Inc. has made a donation of $25,000 to California Thoroughbred Horsemen’s Foundation (CTHF) to distribute to victims of the San Luis Rey Downs fire, it was announced Tuesday. The December fire in Bonsall, California, claimed the lives of 43 horses, resulted in the hospitalization of five trainers and destroyed countless horse stables on the property. Dawn Mellen added 6 new photos. Two year old Lovely Finish, trained by Joe Herrick, was stabled in the barn area that had the most fire and smoke damage. She finished second in her first race at Del Mar just a month earlier. Lovely Finish suffered extensive burns on her neck and face. She was taken to a local equine hospital as she required urgent care. How did Lovely Finish get her name? Her trainer, Joe Herrick, also plays soccer. He told me about a TV announcer who would say, “Lovely Finish”, when a soccer player scored an amazing goal. We would all agree with Joe that Lovely Finish is an amazing horse! ATFL will pay for Gastrogard, Legend and eye ointment for Lovely Finish. Her intake of Gastrogard, for ulcers, has increased because of the added stress & additional medication after the fire. Legend is for joint lubrication. The mediation will lessen inflammation and fight against infection from debris, dust and shavings. The burns on her face came right up to her eye lid causing it to drupe slightly. ATFL will donate funds if she needs to see an optometrist. Dawn Mellen added 3 new photos. Thank you to everyone who donated to help the horses that were injured or burned during the San Luis Rey Downs fires last month. And thank you for trusting After the Finish Line with your donations. We did our homework by speaking with the trainers at the Del Mar Race Track, the Trifecta Equine Athletic Center and many friends in the racing industry to locate horses in need of assistance. ATFL believes the intent for the donations, from concerned individuals across the United States, was to help rehabilitate and care for horses whose injuries and burns were a direct result of the fires. These are the horses that could not return to training and/or racing right away. Luckily, the majority of horses escaped with no physical injuries. These horses are “on track” to race or were able to return to racing. ATFL’s donors are helping in the healing process of three horses, Rmanie’s Grey Suit, Miss Napper Tandy and Lovely Finish so they can get back in the starting gate and across the finish line. Nice news after tragedy: The California Thoroughbred Horsemen's Foundation fundraising effort for victims of the San Luis Rey fire drew more than 6,000 donations totaling $818,000, the racing board was told this week. The reopening of San Luis Rey Downs in Bonsall, Calif., which sustained widespread damage in a wildfire on Dec. 7, has been delayed until April 1 to allow construction of 250 temporary stalls and permit the offtrack training center to receive daily compensation from a stabling fund. Tim Ritvo, the chief operating officer of The Stronach Group, which owns San Luis Rey Downs and Santa Anita, said last month that some stalls would be available at San Luis Rey Downs as early as this week, with full capacity set for the spring. Ritvo said on Wednesday that horses will not return to the property until construction is complete. A leading factor is financing. When San Luis Rey Downs is open, The Stronach Group receives a daily stipend from an industry-controlled offtrack stabling and vanning fund to defray costs. Many of the horses formerly based at San Luis Rey Downs have been housed at Del Mar since the fire, allowing Del Mar to receive funding. By postponing the reopening until April 1, Ritvo said construction can begin on 250 temporary stalls to replace barns lost in a fire that claimed the lives of 46 horses. Barns with capacity for 200 horses were not affected by the fire, he said. Previously, San Luis Rey Downs had the capacity for 495 horses. There were approximately 450 horses on the property at the time of the wildfire. Ritvo said bids have been received from three companies to construct the new stalls, which he said will be 12 feet by 12 feet with canvas roofs. Ritvo said some modifications would need to be made to the temporary barns to give them permanent status. He said debris from the fire has been removed. “Now, it’s a matter of grading it and making sure everything is level, making sure water and electrical is set,” Ritvo said. Ritvo said another benefit to delaying the reopening allows construction to take place without horses on the property. Lovely Finish is looking so much better than she did just a few weeks ago. They are winners shaped by smoke and stress, staggered but undeniably strong — still. They came back, from all sorts of circumstances and in all sorts of ways. So far, at least 26 four-legged survivors who were stabled at San Luis Rey Downs when the Lilac fire pounced on Dec. 7 found a way … while finding their way. One of the first to win after the tail lights of the fire and television trucks blinked dark in the distance was Family Girl, a chestnut filly trained by Peter Miller who romped to a seven-length laugher Dec. 17 at Los Alamitos. The group of horses signal a collective resilience, among the competitors themselves and an industry scarred by a catastrophe that claimed 46 horses and seriously injured three. “We’re going to start smoke therapy,” said Miller, who has shaped 13 of the 24 to find the post-fire winner’s circle. “That’s a joke, obviously. That’s how trainers are. If you don’t laugh, you’ll cry. Time has a way of healing wounds. Stories chronicling the ongoing recovery of those at San Luis Rey Downs have focused on the terror shared on a fateful day. Now, like spring flowers, promise has started to sprout as all that pain loses its grip. Then, healing salves and hyperbaric oxygen therapy. Now, re-energizing gallops around tracks on cool mornings. Then, paralyzing financial fear. Now, eyes readjusting focus on tote boards. Slowly and steadily, reinvigorating progress has taken hold. 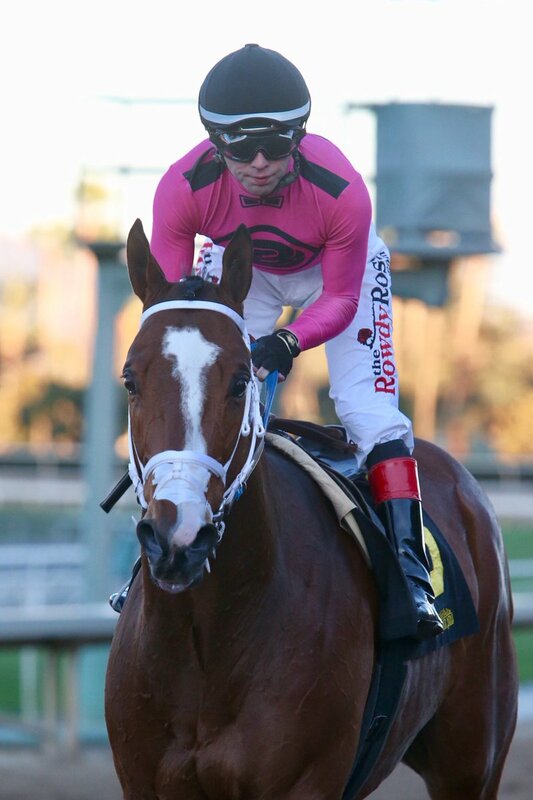 Lovely Finish, who was badly burned along with her trainer Joe Herrick in the San Luis Rey fires, is now training at Del Mar Race Track. Joe said she’s happy to be back in training! Thank you to our donors who contributed to After the Finish Line to help Lovely Finish and other horses injured in the fires.